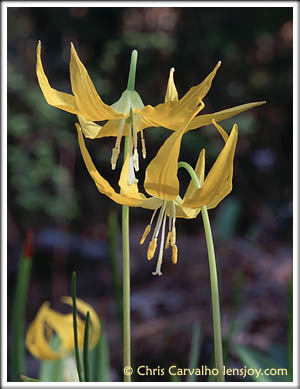 The Glacier Lily or Yellow Fawn Lily (Erythronium grandiflorum) is a friendly wildflower blooming in early spring. In the Columbia Gorge, it grows in moist meadows, usually close to melting snow. These were found along the old Columbia Gorge Scenic Highway near Rowena, Oregon and The Nature Conservancy's Tom McCall preserve, but they are easily found on other popular gorge hikes such as Dog Mountain, Silver Star Mountain, and Grassy Knoll. The simplicity of this composition and the three flowers symbolizing the parent-child relationship are what drew me to make this photograph. Glacier Lilies are also a favorite of mine because of the form of their gracefully curving petals and arch-stemmed flowers that sway at the slightest breeze. The Glacier Lily is closely related to the white Avalanche Lily and is often mistaken for it.